Kuhl Wave, under jockey, Francisco Ramirez, Jr., leads Spit Curl American and Digthiswagon into the Altoona Derby finals on Friday evening at Prairie Meadows. ALTOONA, IA�SEPTEMBER 27, 2013�Kuhl Wave led the top three qualifiers into the Altoona Derby Friday night following a half-length win over Spit Curl American in the last of four trials at Prairie Meadows. The 10 fastest qualifiers will return to the Iowa raceway on Saturday, October 11 and vie for the winner's share of a $50,000-added purse going 400 yards. Ridden by Francisco Ramirez, Jr. Kuhl Wave rallied strongly to complete the course in :19.664 seconds, a 97 speed index, while setting the top mark. Jose Ibarra trains the WAVE CARVER filly for owner Miguel Banuelos. Bred in Oklahoma by Tom Bradbury and Marvin Wilhite, the sorrel miss out of Shazooms Doll, by Shazoom, got her fifth win in 17 starts. 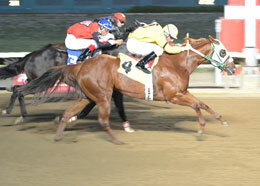 A multiple stakes winner, Kuhl Wave has earned $93,204. Stacy Charette-Hill saddled Hr Ebony Princess to a half-length win in the third trial to post the fourth fastest time of :19.780 seconds. A homebred for Bobby and Vickie Hammer, the IVORY JAMES filly was the first of two finalist her owners. Coming off a win in the $63,500 Iowa Double Gold Derby on September 1st the filly out of Devilish Princess (TB) by Opposite Attract (TB) has won five races and earned $74,733. Also qualifying were Digthiswagon and Pyc First Prize Dash, two fillies by leading PYC PAINT YOUR WAGON. Digthiswagon qualified as the third fastest from the first trial for owner/breeder Vicki Banks. Stacy Charette Hill trains the filly out of Digging On High, by Diggin For Gold. Clinton Crawford saddled Pyc First Prize Dash to the sixth fastest time for Weetona Stanley and Raymond Loup. The Oklahoma homebred for Ms. Stanley is out of First Prize Dash, by Dash For Cash.